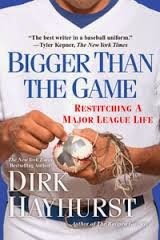 Bigger Than the Game by Dirk Hayhurst was an interesting follow up book to his first two books Out of My League (which I reviewed here) and The Bullpen Gospels about his journey as a professional baseball player. This most recent book was set during a baseball season Hayhurst lost to injury and in the process had to deal with the mental pain caused by not being able to play. In terms of his injury rehab program, it was both remarkable and entirely believable reading about how some medical programs would have a seemingly guessing based approach with the "sure, can't hurt" principle to getting better and then other approaches would be highly methodical. What ultimately got Hayhurst better was care at the Andrews Clinic in Birmingham, AL with rehab direction done there by Kevin Wilk under Dr. James Andrews. While many of the stories of his time there are fairly mapcap and entertaining, Hayhurst detailed some pretty remarkable work done on high profile athletes done at the clinic. Overall, it was an entertaining book on the experiences of a player in the world of professional baseball.